Bonjour! Another sweet day for Fed fans in Paris as Roger cruised past Julien Benneteau in straight sets to book his place in the fourth round where he will meet another Frenchman, Gilles Simon. I knew a few of you were worried about this one after the match at Wimbledon and the loss in Rotterdam but as I predicted Benneteau offered little resistance and Roger was a class above as he eased to a 6-3, 6-4, 7-5 win. The match didn't start well for Fed as he got broken in his opening service game with some really sloppy errors but Benneteau's lead didn't last long as Roger broke back to level at 2-2 and then really started to find a nice groove. Benneteau was looking extremely sluggish once he lost his advantage and it was pretty clear that the marathon five setter he played a round earlier was effecting him physically so once Roger got his nose in front I knew it was going to be plain sailing. As soon as Roger started striking cleanly he was able to break again and take the first set 6-3 yet again hitting a sweet backhand to take his break point which is becoming a recurring theme. Even though he dropped his serve early it was a very routine set and Roger didn't really even have to break into a sweat. I actually thought for a moment Benneteau was on the brink of retiring as he looked pretty disinterested but to his credit he carried out without requiring the trainer or medical timeout. The second set looked like it was going to be another cake walk as Roger created love 30 on the opening Bennteau service game but the Frenchman dug himself out of a hole and that re-energised him somewhat and at 2-1 he had a break point of his own but Roger held firm. At 4-4 Roger created love 40 on the Benneteau serve and then came up with an insane backhand slice flicked passing shot that he made at full stretch with the ball behind him. Pure genius and Roger went onto to serve out the second 6-4. In the third it was Benneteau's turn to come up with something special as he made an unbelievable behind the back volley which was pretty special and I think even Roger just had to nod at that one. Shots like this delight the French crowd, well any crowd really, and when both guys are coming up with something out of the ordinary it makes it well worth the admission fee. Unfortunately for Benneteau though his moment of rapturous applause was shortlives as Roger was just easing through his service games and then upped his level to break him at 5-5 before serving it out to love again hitting an insane winner to seal it 6-3, 6-4, 7-5. 100% BP conversion rate. Boom! I'm happy because I have not used much of my energy so far,” said Federer, who is yet to drop a set. “I'm still there in the tournament, and therefore, I think I can perhaps go deep in the tournament. I feel totally relaxed. Mentally I'm okay. I'm quite confident. I can feel it, which is what you need to be if you want to go deep and have good results here at Roland Garros. Like Roger's first two matches this was another pleasing display and as he went out there and got the job done with a minimum of fuss and expended very little energy whilst doing so. It was obvious today Benneteau wasn't at his best physically so it might have been a little trickier for Roger had he been but I think he would have still got this done in straights. I'm liking what I'm seeing from Roger so far here, he seems very in control of what's happening out there on court and the matches are on his racquet. Today for instance even though he started poorly it wasn't long before he started asserting his dominance on the court and by the end it looked like he was just going to break Benneteau when he wanted to. Very confident. The stats again made nice reading, 100% on break point conversion is always nice to see and overall they just prove Roger was very solid in this match and clearly had plenty left in the tank should he have needed it. If you can have one gripe you'd like to see a slightly higher first serve percentage but really that's nit picking right now, he only dropped serve once in the very first game and from that point on he was very very secure. The one thing I noticed more than ever today was how much Roger enjoys just been on court and playing his brand of tennis, you can tell he genuinely enjoys it. This was probably exacerbated by the fact I'd just seen Nadal beat Klizan and look completely disinterested and unenthusiastic about it. This just makes me realise even more that tennis is just a chore for someone like Nadal. Almost like weekly food shopping or cutting the grass, it's just a means to an end for him and I'm pretty sure once he retires he won't be one of the guys that misses the game. Next up for Roger is another Frenchman in the shape of Gilles Simon who came through in 5 sets against Sam Querrey. Roger completely schooled Simon in Rome a couple of weeks ago dropping just 3 games and I expect something similar here. Simon has historically given Roger problems but I can't see it happening here because Roger has almost learnt how to play guys like him better in the last couple of years, probably because Murray is quite similar in style and it was necessary he crafted a gameplan to beat that type of opponent. Simon has already played two 5 set matches this tournament so I doubt he will be feeling fresh physically. He of course has a day off but I think Roger can take advantage again here and just use his forehand to push Simon around and keep him firmly behind the baseline. Simon is a nice ball striker but lacks any real weapons or power so whilst he can be dangerous due to consistency I think Fed will be able step inside the court often and mix up his play to create angles and plenty of open court to put away the winners when the opportunity arises. I'll go for a 6-2 7-6 6-4 victory. Allez! Sorry well done to you Brandon as today everyone was posting at the same time i got confused who actually won!!! I think you both commented at the exact same time! It is tough at the top Alvi. The strength in depth here is quite amazing. I thought Roger had far too many UEs today, but looking at the stats I was wrong, it was actually a positive W:UE ratio, probably too nervous about the match from the start. Well yeah the start was just mental up there and Roger had to get that block away. Once he broke back Benny had nothing left really, and Roger really sensed that. So the remaining sets was just the auto-pilot cruise mode and breaks when you think he needs and wants to. Overall, good performance and not much to read into it. The BH DTL is still firing. Simon up next. Should be straightforward enough, he had 2 5 setters and 1 4 setter coming into this, so like Benny should be relatively tired. Think it will be in straight sets if Roger implements his game plan as well as he did in Rome, allez! I get the feeling fans are being harsh on him here saying too many errors or not enough first serves despite cruising through. I can’t as for more yet. Hardly spent any energy on court so far and played very attacking. Stats are solid. I think he’s getting past Simon in straights. Really nice win for Fed. Wouldn’t it be weird if Fed makes the final because besides the Aussi open, he would make the only finals he didn’t make last year but miss the ones he did! But strong stats; great on serve. I think Simon will role over like 2 weeks ago. Tsonga scares me though and he almost took out Djoker last year. But Rafa looks the worst of the top 3, wonder why(probably his way of easing to title number 8)… Hope Djoker doesn’t win though… If he faces Fed, he would probably rip his shirt in front of the GoAT. He’s 26 yet immature. Do you honestly see #18 at the end of the tunnel next week Jonathan? Tough to say man, I’m not getting carried away but this is a chance for sure. It would be quite unreal should he do it. Still 4 more matches to go though so it’s not in sight just yet. Tsonga will be a danger but I think Roger may just have something ready for him should they meet. We’ll see! Lets see Fed do a shirt ripper!!! Wld be beside myself if he won next week, so trying to take one match at a time! Just equalling and then passing the FO no of match wins is a bonus, and hopefully making his 35th(?) QF in GS’s! What a legend! Ps loving the haircut now, still not sure about the shirt although seems to suit his play!! Think he will beat Simon in 3! Simon will be tired and has bad hand blisters! Querrey really threw his chance today as did Monfils! Cannot believe he lost! Think Fed just needs to keep focused, keep same tactics and not let expectation get to him as Nadal stutters! We all know that means nothing! And as for Djokovic, we will know more after tomorrow! Fed? Just keep going on the same tactical path! Me too Susie, should get this done in 3. Monfils choked it away. Poor from him. I didnt see the match, but reading your post it seems Federer is focused, and as long as he gets the W i am happy. Hopefully the same result against G Simon. Probably he will have a tougher match with Tsonga but i wont worry about that until it comes up. I just want Federer to simply get through the first week as you cannot win a slam only lose it in the first week. Onwards and upwards. All the way!! Unfortunately missed the match today – thought I had put my sky box on to record – but obviously had a blonde moment and when I got home no tennis!! So thank you for your match report pleased to see that he converted all break points. Hopefully he will be in fine fettle against simon. On another point – any thoughts on Nadal’s whinging having to play back to back days – do you get the impression he is rattled and actually may not win this year? Also did I win a cap!! – never won anything in my life so an RF cap would be so nice!!! Agreed, that someone else will win, sometime. I’m no expert on tennis either. I think Nadal was playing both Brands and Klizan for the first time. Maybe it took him a set to figure them out. Nadal isn’t looking in great form but he’s still coming through his matches. Maybe he could get beat before the semi’s but unlikely. I think Djoker takes him out though. Yeah he’s got the job done with minimum fuss so far. Of course ……… number 31 to comment. Am slowly getting use to that. But one day ….. I will surprise you all. One day Katyani… one day. He guys, I loved today’s match. Although I am Roger’s fan, I cannot watch his matches completely. Way way to nervous, no matter who he has to play. Even if he is winning or near matchpoint I am still nervous and I only relax after he wins. But today’s match I really enjoyed. Roger came up with some amazing shots. I thought he played pretty good. This was his 899th win, next one will be 900th and when he wins he will not lose his QF-streak, so hoping he plays great, defeats Simon and tries to do it with saving energy. After that, it is still looking at it one match at the time, but can we hope now……….. It is looking really good. Tomorrow (or later today, it is almost half past two in Holland) Dimi will play Novak. I really wanted to watch that match, but I have somewhere to go. Who do you guys think will win? I actually am rooting for both. I have said this before, but Novak is REALLY thin. That is not healthy right, to be a man and to be that thin? Roger and Rafa are both 1.85 and both weight 85 kilos. But Novak, no matter who he stand next to, he is always thinner. You want to know something unbelievable? On BR they actually think Fognini will make it difficult for Rafa and could win a set. Did they not see Rome? Rafa will destroy him again, I think 6-2, 6-1, 6-0. Djokovic will beat Dimitrov. Djokovic is not “unhealthy” skinny. He is just extremely defined. I am of the opinion that he is the ultimate physical specimen in men’s tennis. The CVAC pod helps though. Has Fognini ever won a single point against Nadal? Maybe he has, but I’ve never seen it 🙂 It should be a demolition. Just chiming in re Novak – he has a slender frame but deceptively so I think. There are some pictures out there of him without shorts and his thighs are enormous. Yes, but even if Novak stands next to Goffin or Dimitrov, he is still thinner. And those two have the body of a boy. Speaking about Novak, was sorry to hear that his first female coach passed away. Yeah Novak is naturally slim but he is pretty ripped. Like Sid says he is the perfect type of build for tennis. Missed the match unfortunately, Marion took too long so I was spent from work. But Fed said that he was all too aware that Benneteau wasn’t 100% and he expected him to pull out at one point but a 6-3, 6-4, 7-5 probably doesn’t say that so he hung in there. Caught the highlights and I’m really liking what I’m seeing. Roger has already played a better tournament than last year- much more comfortable and confident on the clay it seems and the aggression is very visible. He’s going for the return a lot more and his net approaches have increased- he’s right when he says he hasn’t had to use a tonne of energy to get by in these matches. However, I think Roger is disappointed that Julien wasn’t the test he was expecting, especially since he is only one win away from Tsonga (who had a particularly easy quarter, he’s flying under the radar nicely). Speaking of flying under the radar- Djokovic is doing a good job at that. Nadal’s struggles and complaining once again has taken main stage, so I understand what Gulbis means by boring if he’s talking about Nadal’s non-sto whining. Why does he have to go press for? Can’t take it up with tournament organisers? Dramadal. The thing I found hilarious was not why Nadal was scheduled after Fognini…but who? Who other than Lukas Rosol. He may not be beating him on the court but even then he’s still getting one over Nadal. Well played Rosol, well played. Great comment. Particularly enjoyed the Rosol-Nadal part of it. Keep them coming. Hi Alysha, love that name “Dramadal” !!!. We will use that too I think. Rafa is a whiner and complainer and thinks only about himself. Sharapova also won RG last year, she also could not finish her match, she also had to finish it the day after and also had to play her next match the following day. 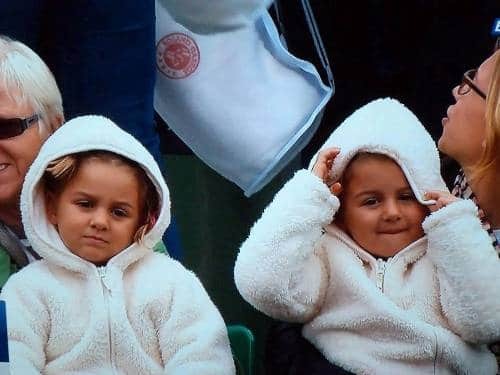 They have that in common, what they don’t have in common is that Maria just played, without throwing tantrums or making threats or complaining. This just separates the women from the men !!! You see Rafa is really just looking out for himself. So…. the opposite of Roger. Also something interesting, Andy recently had his 400th match win, Novak today his 500th match win, Rafa a while ago his 600th match win and Roger tomorrow his 900th match win. Ps: Alysha, I really like your comments, I look forward to them. “Dramadal”, how do you come up with stuff like this??? Alysha, you nailed it…Dramadal! Well played Rosol, indeed! Dramadal. That ones a keeper! 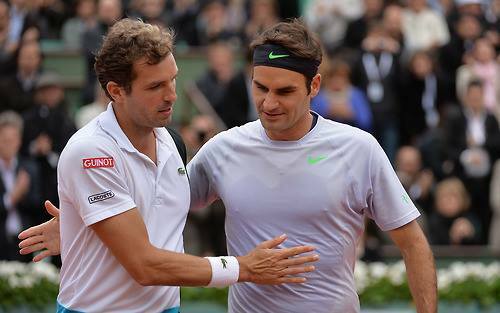 Glad that Roger is through and he capitalized against an injured opponent. He played with conviction and stuck to his game plan. He is a man on a mission and he knows he has a decent shot reaching the final. 3 French men in a row, wow – playing against home crowd is tough. Based his and Simon’s current form, I think he will get through in 3 close sets. The French crowd love Fed though, I reckon he gets more support than Simon today! I found that hilarious too! 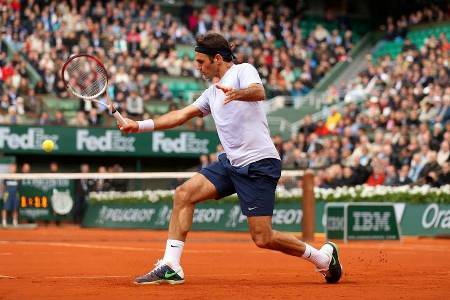 Loved the way Roger strikes the ball, specially forehand with more purpose, more down the line. Also sweet backhands with insane angle, too. He is definitely playing better than last year. Allez for 900th win/58th FO win/36th G slam QF! Uh oh! Dimwitrov is getting schooled. Did you really expect anything else? Yup, I like it that Stan and Tommy made it. I don’t like Isner’s tennis and Janowicz I don’t like at all. Yeah, I’m out of shape these days… 😉 I can’t stand janovicz as a person, but he’s got an interesting game, once he chooses to hit the dropshots at the right moment, and when he starts yelling when it’s an important point…. Haas is looking good here, could make Quarters! Sublime performances from Roger in his first three matches and it will be surprising if he does not beat Simon in anything less then three straight-forward sets. I am completely unworried about his semi should he make it and he will beat whomever he faces there with room to spare. In the final if it’s against Novak, he stands a real chance of winning and even if it’s against Nadal, he might, just might, surprise. The only person I am worried about though is Tsonga, he will no doubt easily beat Troicki. I just hope Roger is absolutely on fire for this match as I have a feeling he will need to be. Yeah Tsonga could be a tricky one, he’s better than people think on clay. Hi guys, here is an article you might want to read. It is something we all have known for a while, nice to see that someone else thinks it too. Did you guys notice something……. me…….Katyani…… I just posted a comment with a link to an article or I just linked an article or whatever you call it……. I did it and it worked !!! Yes, I am finally in this century. Man, in a while I too will do stuff you all take for granted !!! Allez !!! And to you both: like one match at the time, let me take it one step at the time. I am just happy that this worked. And to be honest, you do know it is still me? Sid explained how to do a smileyface, but it just does not work for me, so Gravatar will eventually happen. Don’t worry. Later the matches of Roger and Tsonga. Tsonga will be really dangerous for Roger. He plays extremely good, not to mention Ferrer. Still hope he does not realise that enough is enough, no more losing to Roger. But first Go Roger Go. And Sid…… go easy on me. I am having a bad weekend. I thought you had linkphobia Katyani, got over it I see! And like Sid said, why no Gravatar!? Fortunately, I missed the first few games so I didn’t have to worry right from the get go – gets me way too anxious when he starts like that. So really enjoyable match from the point where I joined in to watch and looking forward to the next one. I think he’ll come through over Simon. Yeah was a strange start but always felt like he going to get back into it which he did. Hope Simon get’s the same treatment. Nadal is so spoiled and selfish! He forgot that Roger played very late in Rome before he played Nadal the next day. No one else complained about their schedule. As for Isner, I pull for all Americans except for Serena. I had mixed feelings about Isner and Hass. Hass is an adopted American. I am glad he won. Isner has time to win. It was a great game to watch. I haven’t gotten to watch Roger play. He has not been in the replays. Nadal and Serena have dominated the air. Hopefully, I will get to see Roger tomorrow. Since Roger is playing a Frenchman, I feel sure it will be shown. The entire match. Yeah I’m glad Haas beat Isner, good win for him. I’m sure Fed will be on TV, it’s the showcase match. Not often you see something like that. The resurgence of the single handers, allez! And it’s made worse by the fact that RG doesnt have night matches. It’s unbelievable. What, people dont have to work in Paris? Yeah discount tickets would be a good idea! Jesus… what a forehand that was… AROUND THE NET POST FFS!!! omg… he took a bad fall… went down on his wrists hard. Looks painful. And he’s been missing so many forehands after that… We know how much wrist he uses for his forehand. This is worrying. Hey guys I only just tuned into the match. What’s going on with Roger? It’s not looking good here. Simon looks to playing some good tennis. Has this “fall” of Roger’s done some damage? Hope not, c’mon Rog! Guys, I still believe in Roger. He will up his game. Looks impossible now, but……. Oh my god… 2 sets to 1 down. If he wants to win he will have to go five sets. Hope simon gets fatigued soon!! omg, that fall certainly did some mental damage, he has been so subdued, sucked into the Simon way of playing!needs to believe and attack! I saw the fall replay, hmm, didn’t look too bad but mentally he’s lost it. Guys, if he doesn’t make it, it’s been a fun 35 consecutive QF journey. Alysha, he is FIGHTING back !!! Yes Katyani he sure is, looks very pumped on the court. Needs a quick set here to put Simon back on the leash he had him on in the first. Well he’s just broken Simon in the fourth so here’s hoping for good things to get ourselves to a five and outlast Simon physically and mentally. ALLEZ! This is like Australia 2011 all over again. I am nervous too. I am very worried about his wrist. Johan, if he wins he has a day to rest and look out for his wrist. And you can see the hunger to beat Simon and the fighting spirit is back. It will all be oke. 3-0, hope he does not let Simon back in. You know, I have to say this, don’t know if you will all agree, but Roger is the only one or one of the few who takes risks at the most important nerve wracking moments!!! Oh yes, we are back. Who begins next first Roger or Simon? Ahhh there we go. Ok Roger has to be comfortable now. He as his confidence and momentum back as he should, here’s hoping this isn’t a marathon fifth and he can get a quick lead and close it out. Guys, I believe we are seeing the best of Roger’s fighting spirit now. I think he knows his usual fast and low forehand is not working, but he’s trying all sorts of things to win. I am touched! I think he will still win this!! On to the fifth set!!! Roger 3.0. The “fight” we were all talking about missing in the first half of the year as come back to save all of us. Roger has to be confident to run with the match now right? Seriously, I was always worried about Tsonga, because he plays right now too good, but now I am 100 % sure, no matter if he is behind against Tsonga, he will BEAT Tsonga. WELL GUYS…… WE DID WANTED HIM TO BE TESTED…… SO WE GOT OUR WISH. I will bet you, if he wins this, he will I repeat HE WILL beat Tsonga. Really, bring on the second half of the year. This is Roger beeing rebirthed !!! He is back, especially after seeing guys like Haas and Robredo, he is not going anywhere. He got the taste back of fighting. And I think, the crowd beeing behind Simon is doing something to him, he is more pumped up to win. well let’s not get ahead of ourselves. He still hasnt won this match yet. For all we know he may still lose this. But yes Katyani, what a good test for Roger. This match is really showing what a great problem solver and creative thinker Roger still is. Johan, this is why I think he will defeat Tsonga. Tsonga is playing way too good at RG, he is almost unbeatable. Roger may not have played that well today, but he knows how to fight back. Like he did today. He just didn’t want to lose. It is not like Simon began playing bad, Simon just upted his game, but so did Roger. Really, he knows this is the last chance he has at RG to have such a draw and he knows that this might be his last chance to win at RG, so he is not going to lose, atleast before the final. Against Tsonga will also be a 5-setter. I think we can be sure of that (unless Tsonga wins before that), maybe he will play as ‘bad’ as today and maybe with even more ue’s, but I know he will overcome Tsonga. And today was a 5 setter, but it was only three hours, not even a long match for a 5 setter. Katyani! I agree with you that he will beat tsonga too. The way he played before the fall was great. Not as good as when he played Devarman, but not bad too. If he played like that or better, I think he has a great chance. And today’s match hopefully awakens his fighting spirit. I hope this will sharpen him the way the wawrinka match sharpened djokovic at this year’s AO. But man, did he luck out. 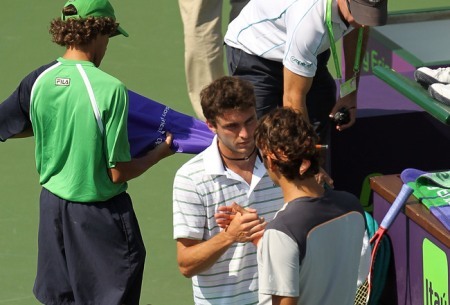 The fall was bad luck, but it was good luck that Simon wasn’t playing very well when Roger wasn’t playing very well too. In the fourth set Simon let slip a damn lot of chances, making unforced errors for put-away winners. I was thinking if this is djokovic or nadal, they’d nevel miss on those kind of opportunities and Rog wouldnt have a fifth set at all. So it’s lucky that it’s Simon that he was playing. Maybe it was fatigue from his previous 5-setter or just weak mental strength, Simon was pretty shaky in the 4th and 5th sets, and that allowed Rog to get this confidence raising win. Man a life, i needed to be resusitated as i was a total nervous wreck!! But yes Roger has done it, his record still intact. Whooooohoooo:) . Ok Roger, very funny, thanks for the heart attack! I always feel like an idiot every time I doubt him but boy you cannot blame me, everyone was holding their breadth for the streak record after he fell. He said he lost confidence after that, he must have been cautious playing with it- a bit too cautious. Despite playing well, Simon wasn’t a test by any means. Roger was the one who gave him two sets. So this match can now join the rest at this tournament entitled “unnecessary five set matches.” This match wasn’t too physical so he should be ready for Tsonga. This is where the real danger lies guys so enjoy the victory now but I am on the fence for this one. Anyway who cares, 36 CONSECUTIVE QFs and 900 VICTORIES- Legend! p.s- what the hell was that around the net shot? bloody hell this guy is a genius. Haha Sid! More like well played Simon! Heartbreakerer…nearly! He certainly has a flair toward the dramatic.